Finance/Accounting key performance metrics include net income and EBITDA, working capital, receivables, etc. For Sales/Marketing, KPI’s relate to growth, new products sales, market share, etc. Operations scorecards track safety and environmental compliance, cost, quality, service, productivity, asset management, etc. Helps local employees understand the overall business and how their performance ties to company strategy and results. This understanding motivates employees and enables their professional growth. Aligns functional stakeholders, encouraging accountability and cross-functional collaboration. Stakeholders include vendors, employees, contractors and customers. Links the CEO and leadership into the business’ operating performance, helping the company to be more nimble and opportunistic. Also encourages banks and boards to speak the language of the business, enabling them to more effectively support the company and its strategy. We can help. Group50® Consulting offers organizational development and strategic execution services that can cater to your specific business, from targeted process assessments to a Lean Business Physical. Our assessments identify the unique opportunities for your organization and our workshops, systems, and training will bring focus to your priority areas. 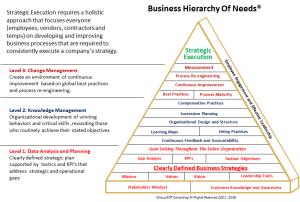 If you want to learn more about how the Business Hierarchy of Needs® and Group50’s other tools and methodologies can help your team develop a common language drop us a line at info@group50.com, call us at (909) 949-9083 or request more information here.